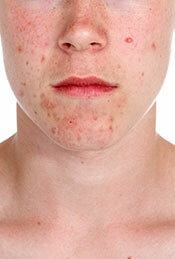 Acne is a skin disease that affects millions of Americans every year (most typically teenagers). It can vary from mild to extremely severe. While some people find success controlling their acne with topical creams and lotions, others turn to oral medications. Unfortunately, many of today’s most popular acne drugs also come with undesired side effects. There is no reason to worry. With advancements in lasers, light, and phototherapy treatments, you have more options today to control acne than ever before. If you are fighting acne and feel like you’re losing the battle, give us a call to discuss several treatment options which may be effective for you. Click here to read an article about drug-free acne treatment. NEW Cosmion Acne Products are available from Gateway Aesthetic. Click here for more information and to order online or visit our retail store. Get Cosmion Acne Pads exclusively at Gateway Aethetic.